Stamping Sara: Did someone say walk? I spent a long weekend at a scrapbook retreat with some of my crafty friends. I packed a lot of stuff and luckily completed a lot of stuff! I have wanted to make this leash holder for a while. I finally found the perfect saying for it and completed it at the retreat. The jar is to hold either a treat or a doggie bag. 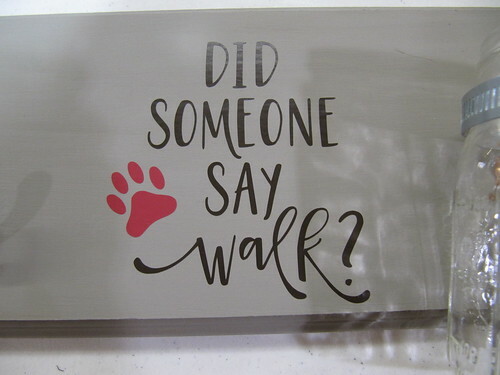 I started with a wood plaque I picked up at Hobby Lobby and some chalk paint. 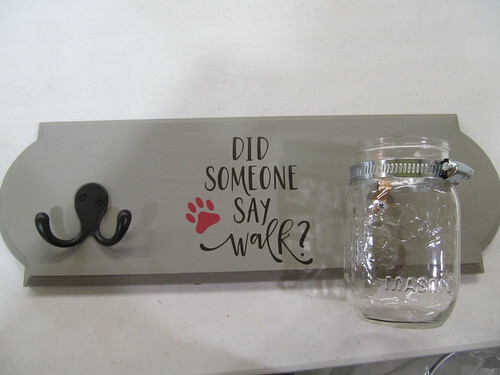 I had a lot of fun at the hardware store looking for pieces to hold the mason jar on and the hook for the leash. I finished off with a vinyl quote cut with a file from Lori Whitlock.